Wisps are ethereal creatures that are used by wispmothers to lure hapless adventurers in before joining their wisp "children" in direct combat. Wispmothers are extremely dangerous creatures for lower level characters (roughly below level 20) and for characters vulnerable to frost. They have great perception (rendering a medium to low Sneak skill useless and a higher sneak will be difficult unless the wispmother is approached from directly behind) and can spawn an infinite number of Shades (clones) which don't disappear on their own over time (but will die easily). 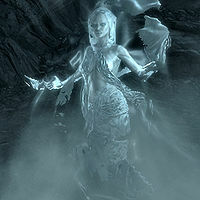 Wispmothers attack with frost, and are vulnerable to fire as opposed to most other elemental attacks. 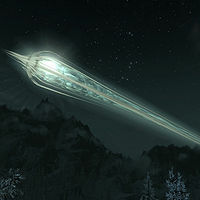 When a wispmother is killed, all remaining wisps will drop dead and turn into ball-like objects which yield Glow Dust when collected. 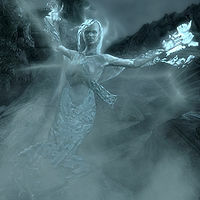 Whispering SpiritsDG are found in the Soul Cairn and cannot be interacted with in any way. The wisps themselves are generally passive until attacked and the wispmother will only spawn if the wisps are damaged, making this encounter avoidable. Occasionally if a wispmother has summoned a large number of shades, the game may crash upon saving at any time after killing the wispmother. ? This page was last modified on 10 December 2017, at 15:19.